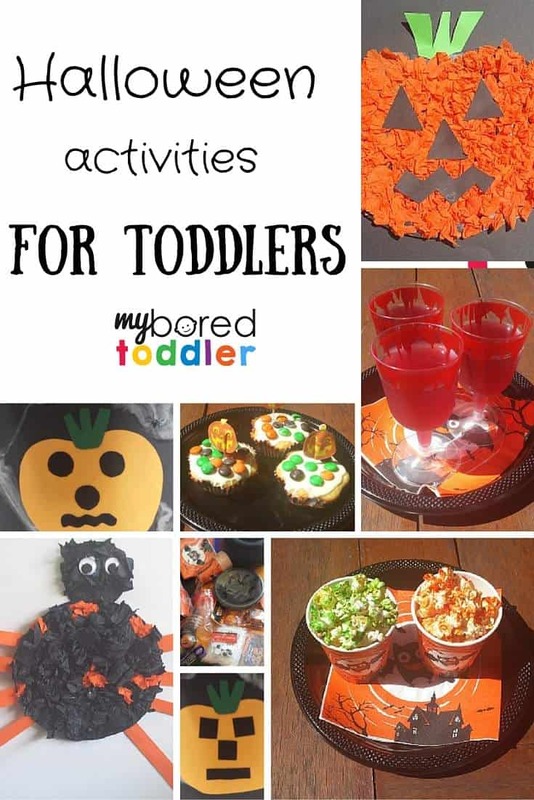 You are here: Home / Craft for Toddlers / Spotlight on Halloween! Until recently Halloween wasn’t celebrated much in Australia, but in the last few years that has changed a lot. Halloween is quickly becoming a popular event, and you can see why. The chance to dress up, decorate your house, and make some great Halloween crafts and treats is just too much fun! 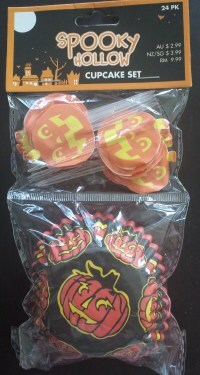 This year Spotlight invited me to see their Halloween range in store (there was so much to choose from), and I was lucky enough to be able to choose some fantastic items to use for our own Halloween celebrations. 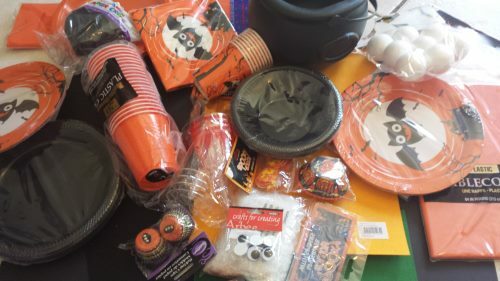 I was able to do all of my Halloween shopping at Spotlight, including decorations, craft items and baking essentials, and we have had a great week getting into the Halloween spirit. Just a few of the great items we bought on our shopping trip at Spotlight! Would you like to see what we made? *You can find all of the items required for these at www.spotlight.com.au, or at your local Spotlight store. Glue the crepe paper onto both circles. 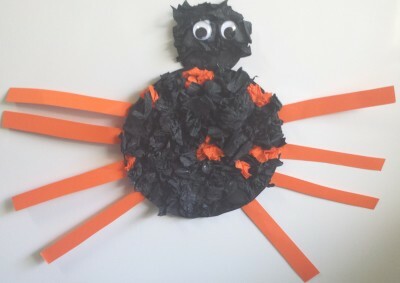 Cut out 8 thin strips from the orange construction paper and glue onto the spider’s body. Glue the googly eyes onto the spider’s head. This felt pumpkin has removable and interchangeable eyes, nose and mouth, to make a simple yet fun activity that is great for toddlers. 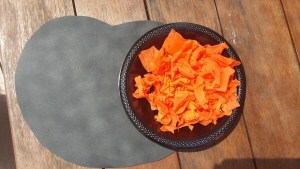 I piece of orange felt – firm felt is best if you can get it, although normal felt will work too. Using the black felt, cut out a variety of eyes, noses and mouths. There cupcakes were made by my toddlers, with very little help from me. They had heaps of fun making them! 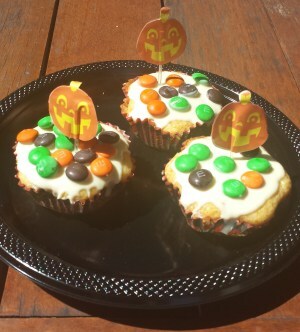 The fun of this activity was in the decoration, so you can use any cupcake recipe. I have to confess that we used a packet mix for this one, allowing us more time to ice and decorate them. Halloween cupcake cases & toppers. We used the Spooky Hollow set pictured below, from Spotlight. Make basic cupcakes, following the directions of your favourite recipe, and using the Halloween cupcake cases. Spread the chocolate onto each cupcake. I let my toddlers do this part, being careful that the chocolate is not too hot. Let your toddler place M&M’s on their cupcakes. There’s a good chance that they will be eating the M&M’s as they do this so make sure you have enough! Place the Halloween cupcake topper on the top. These were a hit in our house, and we took some of the extras to playgroup where they were very well received. These jelly cups were probably my kids favourite treat and they were the easiest to make. We made them with red jelly, but green would look great too. Let set overnight and enjoy! These popcorn cups are a hit at kids parties, and they don’t contain any of the nasty ingredients that you sometimes find in the bags of coloured popcorn. They’re quite healthy too, if you air pop the popcorn. 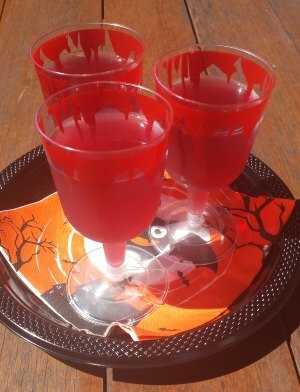 For this we used these great Halloween themed cups, which are the perfect kiddie sized serving. 2 cups of popped popcorn (you can pop them however you like. Air popped is the healthiest, but microwave popcorn works well too). Orange and green food colourng. Add in the popcorn and gently mix them together. Spread the popcorn out on greaseproof paper until the kernels are dry. 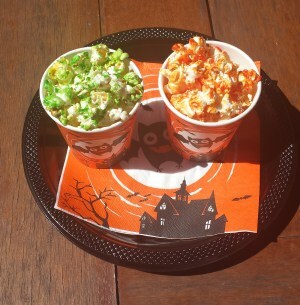 Serve in the Halloween cups. 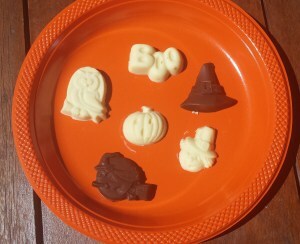 A sample of the homemade chocolates that we made. 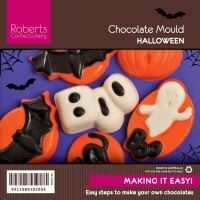 Halloween chocolate moulds. We used the ones below from Spotlight. As mentioned earlier, all of the items we have used this week were purchased from Spotlight. They have a fantastic range of costumes, crafts and decorations and my kids and I have had a lot of fun using their items. You can find more Halloween crafts here, including Halloween Costume Ideas and Halloween Books. If you want to keep your toddler busy makes sure you subscribe to our weekly newsletter and follow us on Facebook, Twitter , Instagram and Pinterest. I love Halloween. It is such a fun time with all the decorations and costumes. Love all these recipes and crafts for halloween! 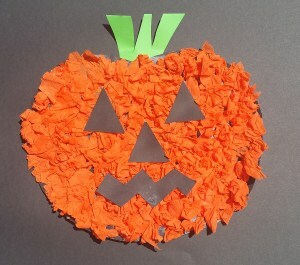 I love the crepe paper pumpkin! So cute. 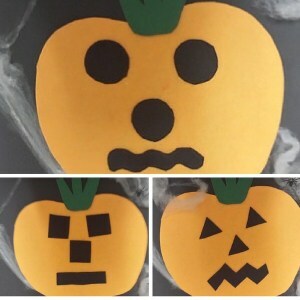 What fun Halloween crafts for tots and thank you for sharing with us!!! 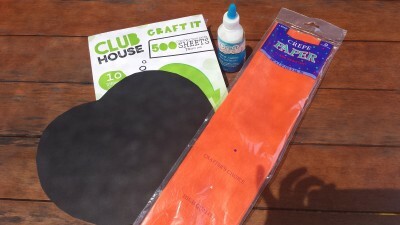 These look like fun projects! I will have to try one with my niece. I love all these fun ideas and am looking forward to Halloween evening to see all my grandchildren 🙂 all 8 dressed in there costumes L) so excited!! We don’t celebrate it much in New Zealand .The shop keepers are trying to push it more as it means more revenue for them but I like the home made items like these. I always forget about shopping at Spotlight! Thanks for the reminder. Hope you don’t mind, I am sharing your Crepe Paper Pumpkin in my Halloween round up post – will be linking up for #ToddlerFunFriday. Of course I don’t mind! Thanks! I know it says these are for toddlers… but I’m doing them anyway haha. This is a great list of activities. Pinning this for next year’s Halloween party! 🙂 Thanks so much.